6 December 1957: At 10:28 a.m., Lockheed Aircraft Corporation’s Chief Engineering Test Pilot Herman Richard (“Fish”) Salmon, and co-pilot Roy Edwin Wimmer started the Number 4 engine (outboard, right wing, of the new prototype Model L-188A Electra, c/n 1001, registered N1881. Also on board were flight engineers Louis Holland and William Spreuer. In rapid succession, the flight crew started engines 1, 2, on the left wing, and 3, inboard on the right. The prototype then taxied to the eastern end of Lockheed Air Terminal’s Runway 27.¹ At 10:44, Salmon released the brakes and the Electra rapidly accelerated down the runway. It was airborne in just 1,800 feet (549 meters). 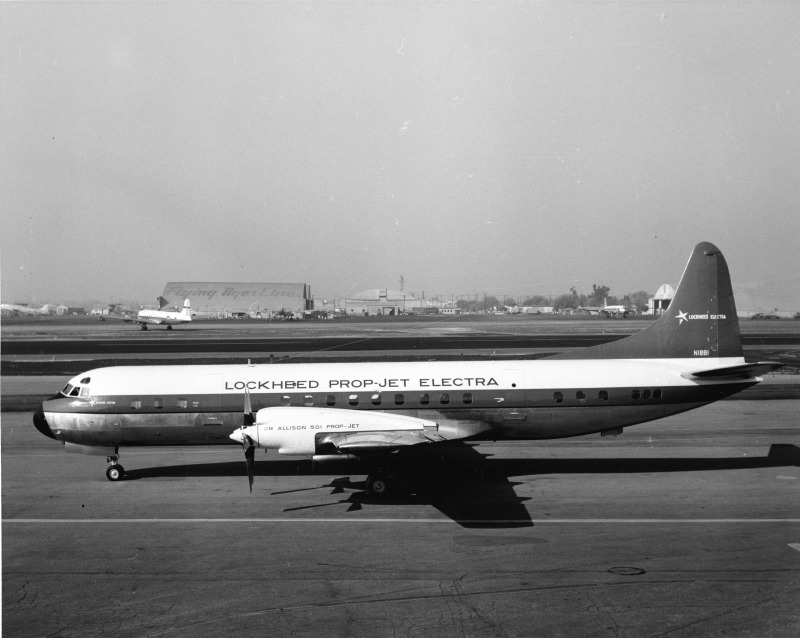 The Electra was followed by two chase planes, a Lockheed T-33A Shooting Star, and a Super Constellation airliner. 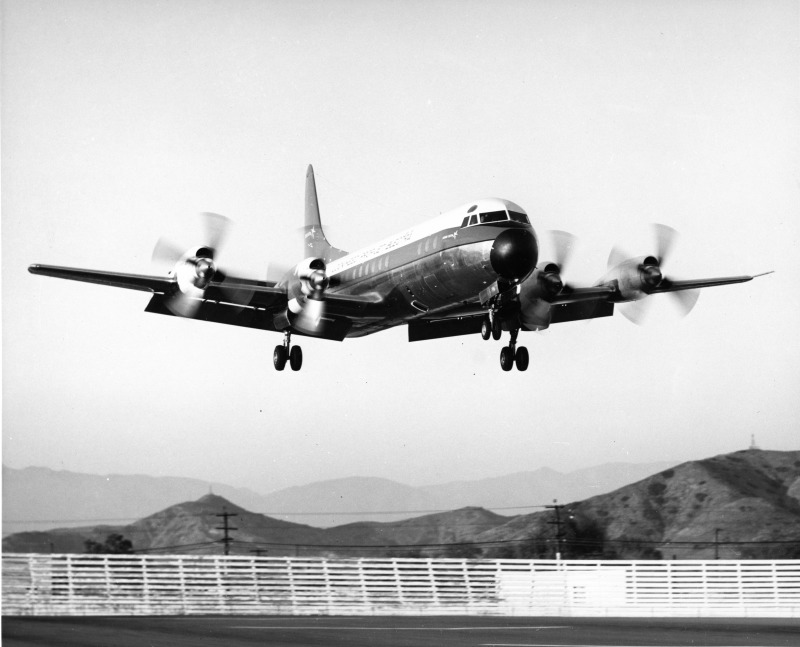 After the initial flight test, Salmon returned to LAT, landing after a flight of 1 hour, 27 minutes. The test flight was made 56 days ahead of schedule. 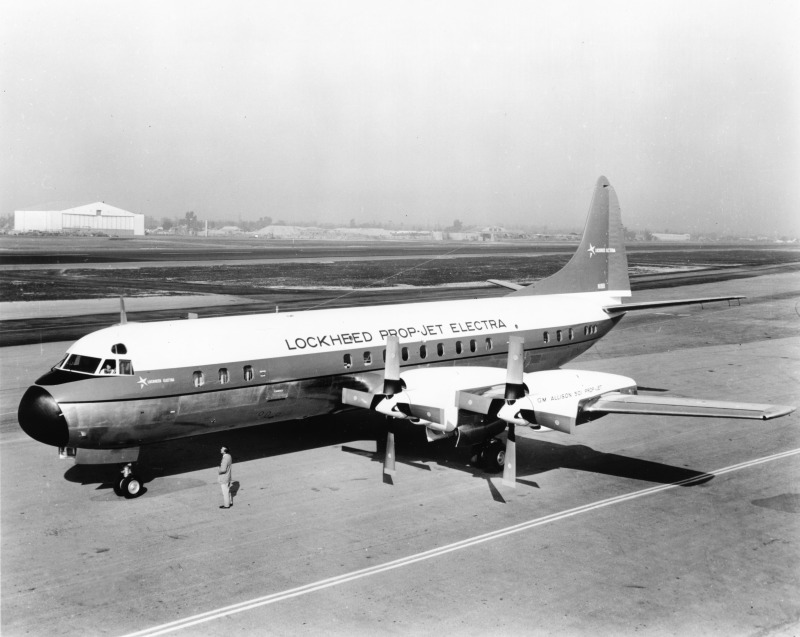 The Lockheed Model 188A Electra is a four-engine, low-wing, commercial airliner with retractable tricycle landing gear, and powered by four turboprop engines. 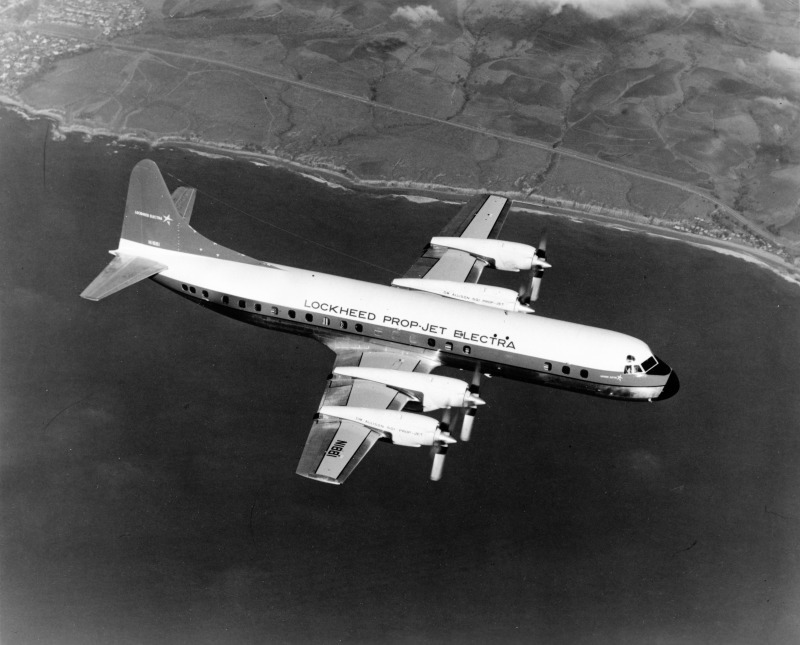 It was operated by a pilot, co-pilot and flight engineer, and could carry a maximum of 98 passengers. 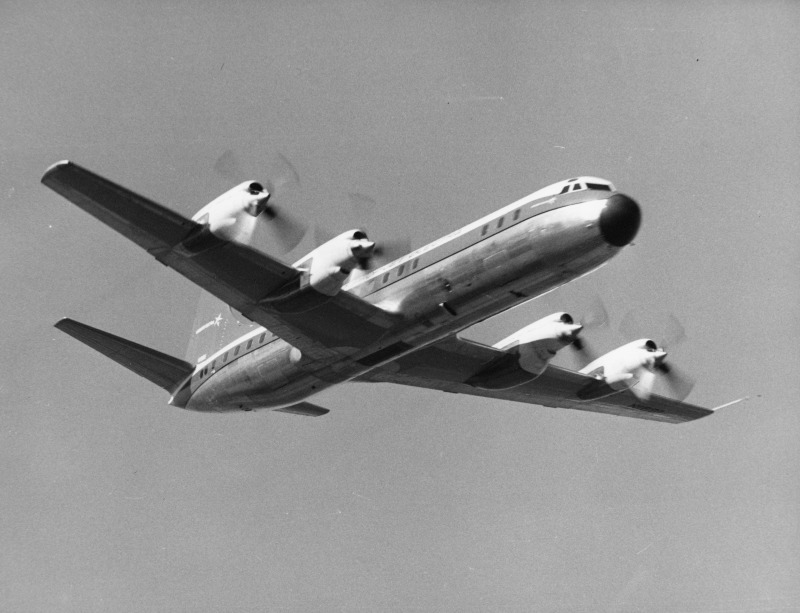 The L-188A was the first production variant. It is 104 feet, 6.5 inches (31.864 meters) long, with a wingspan of 99 feet, 0.00 inches (30.175 meters), and overall height of 32 feet, 11.6 inches (10.048 meters). 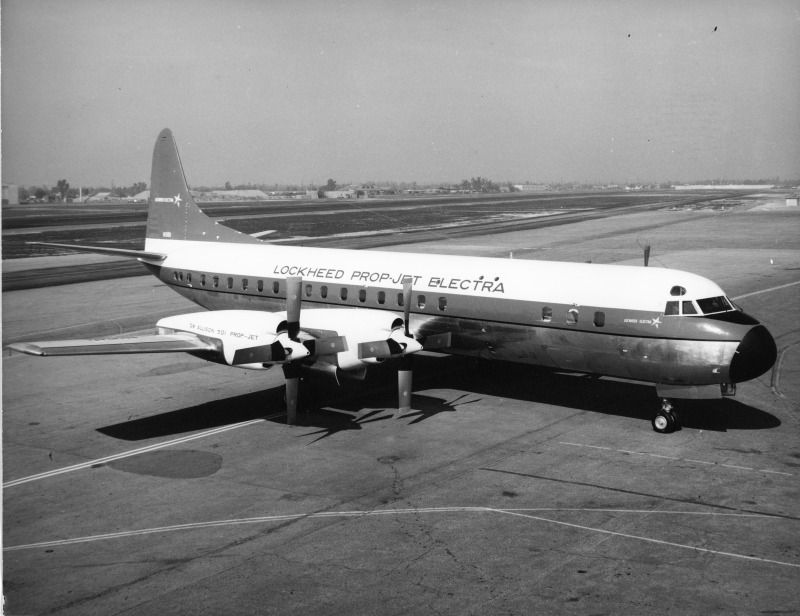 The L-188A was powered by four Allison Model 501-D13 (T56-A-1) turboprop engines. The -D13 is a single-shaft axial-flow gas turbine engine. It had a 14-stage compressor, 6-tube combustor, a 4-stage turbine. It was rated at 3,750 shaft horsepower at 13,820 r.p.m. The engines drove four-blade, square-tip Aeroproducts propellers with a diameter of 13 feet, 6 inches (4.115 meters), at 1,020 r.p.m. The D13 is 12 feet, 1.0 inches (3.683 meters) long, 2 feet, 3.0 inches (0.686 meters) wide and 3 feet, 0.0 inches (0.914 meters) high. It weighs 1,750 pounds (794 kilograms). 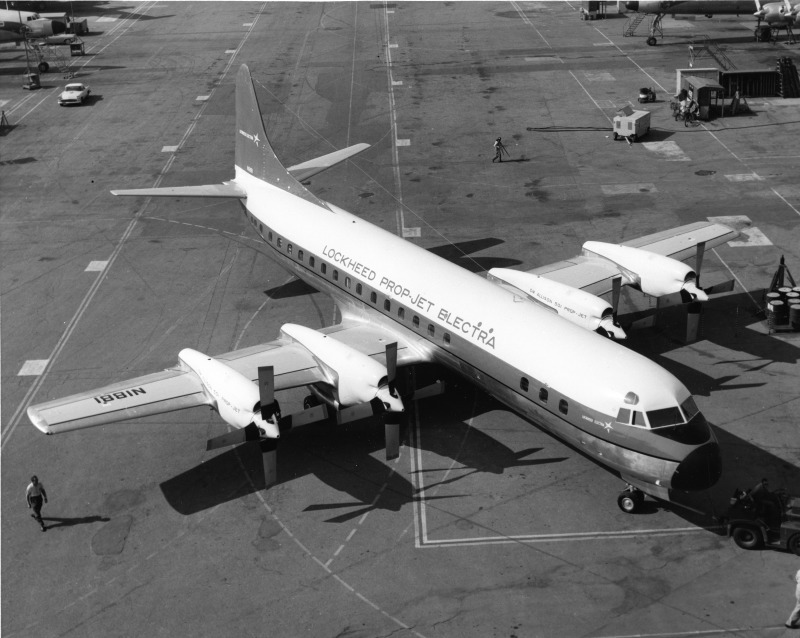 ¹ In 1967, the name of the Lockheed Air Terminal was changed to Hollywood-Burbank Airport. After several more name changes, including Bob Hope Airport, it is once again known as Hollywood-Burbank. Its FAA identifier is BUR.